In the past weeks, ISTP’s Early Years program on Cowper Campus bustled with activities in preparation for our Chinese New Year Festival. It seemed as if the whole campus caught the year of the snake fever! To begin our preparations, students were introduced to the traditions and stories of Chinese New Year through skits, storytelling, songs, acting, art, and cooking. 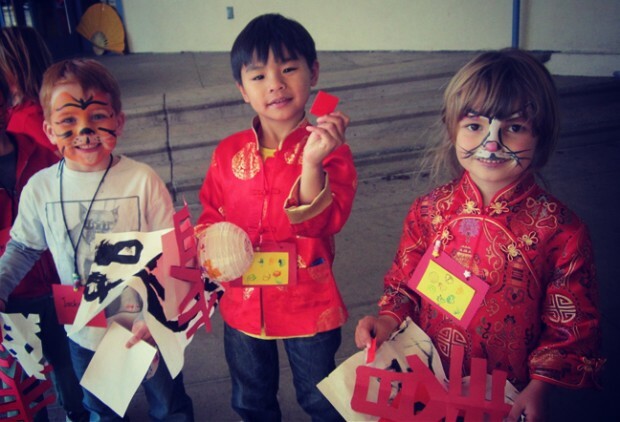 The Chinese Kindergarten section began by learning the legend of the animal races. As the tale goes, 14 different animals were selected to compete in the great race across the river. The order in which each animal finished the race is reflected in the Chinese zodiac. Students reenacted the story in a skit, and wore headgear reflecting the 14 different zodiac animals. Next, students were introduced to the story of the “year monster” that was chased away on the first New Year by light, fire and the color red. As is tradition, the children created their own “fire” by making firecrackers and lanterns from paper. They studied the calligraphy of the characters for spring and luck, which they added to the firecrackers and lanterns to hail the coming of each in the New Year. By Friday, February 15, everyone was ready for our big day of celebration. The social hall doors opened at 9 am for our first group of festival-goers. The pre-Kindergarten section began their celebrations by listening to Chinese New Year stories and fables read aloud. The pre-Kindergarteners were excited to try a new “big kid” activity – the stilt-walking obstacle course – which they took to like fish to water. They also participated in the chopstick competition, practiced Chinese paper cutting, and created mini origami fans. The favorite event of the morning was creating folded glittering dragons with Cécile and Mélanie. The morning came to a close with festive glittering dragons flying in all directions! The Nursery section began their festivities with a ring game and an obstacle course set up in the middle of the hall. Students’ smiles got even wider as they made their own dumplings and rice balls, representing money and good fortune, with our parent volunteers. But the hit of the day for the Nursery section was lantern decorating. They used stickers to make their lanterns come to life. To complete their special day, Nursery students had the chance to get their faces painted! At midday, everyone on campus ate a special Chinese New Year hot lunch. The children feasted on noodles, orange chicken, green beans, and an orange and fortune cookie for dessert. The Kindergarteners were the final group to visit the New Year Festival. The Kindergarteners practiced writing the New Year character in traditional calligraphy. They also tried their hands at a peacock feather toss, marbles, a chopstick competition, stilts, and the 7-piece board game. The star of the show was our face-painting booth. By the end of the day, the social hall was crowded with tigers, cats, dragons and rabbits prowling around every station. The joy and excitement was palpable. As a wonderful close to a very full day we had the pleasure of experiencing a Lion Dance performed by Studio Kicks. The lion and the dragon were fierce and ferocious. The dragon danced around teasing the children and stealing shoes. You could hear excited oohs and aahs at every new trick. The day was full of wonderful experiences students will remember for a long time to come. Thank you to the parent volunteers, teachers, and staff who made this wonderful event possible!